Much as the first weekend of May has traditionally signaled the beginning of the summer movie season, so does the first week of November signal the beginning of the holiday movie season. Both are quite premature relative to the label of their respective seasons, but both have recently seen excellent box-office turnout that is widely regarded as the beginning of something big. This year is no different. This weekend, we see the debut of three high-profile features. Leading the way this weekend is Monsters, Inc., from Disney and Pixar. This often-reliable tandem has been one of the most consistently successful producers of movies in recent history, both critically and financially. The first team-up was 1995's Toy Story, which, while being a breakthrough in animation films, was also a monstrous hit with fans. The movie opened to $29.14 million and ended up accumulating a total domestic gross of $191.78 million; both outstanding numbers. The next team-up by these two studios brought us 1998's A Bug's Life, which also opened to a very hefty $32.83 million and a final total domestic box office of $162.79 million. The third and most recent collaboration, Toy Story 2, pulled in an outstanding $57.39 million over the 1999 Thanksgiving weekend. The movie's final domestic box office total of $245.82 million is a testament to how well the film was received. The importance of these numbers lies in the inherent excellence associated with these films and the wide appeal and acceptance they have within the movie-going public. There is an expectance of high quality associated with Pixar productions that will bring out movie-goers. If that alone isn't enough, the barrage of Disney marketing has certainly built enough publicity to make Monsters, Inc. a huge success. Monsters has received the usual heavy hype from Disney, including cross-promotions and strategic advertising aimed at garnering the largest audience possible. The television ads for Monsters have not been abundant, but awareness is high due to constant marketing within pre-existing Disney merchandise, such as home movies and DVDs, as well as a television special that coincided with the airing of the original Pixar favorite, Toy Story. Given the doubtless high-recognition factor, the movie will definitely do well, but if the numbers for the previous Pixar movies show us tremendous success for the studio, it also hints at the fact that Toy Story might be a franchise with its own measure of success. Monsters, Inc. will likely not open as well as Toy Story 2 did, seeing as how Toy Story 2 was a sequel to a highly-successful movie, but it also shouldn't open any lower than A Bug's Life. 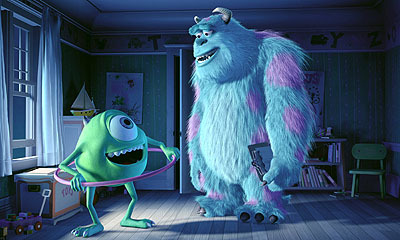 Monsters, Inc. looks like a funnier film, and is even getting better early buzz than A Bug's Life. Opening into a market looking for a hit and that really misses children's movies, I would expect Monsters, Inc. to open in the range of $42-45 million. The other release that is poised to do really well this weekend is Jet Li's The One. This sci-fi/kung-fu thriller promises big effects, big action and lots and lots of popcorn fun. It's certainly safe to say that Li is no longer trying to invade the North American movie market, but that he has already arrived and has established himself as one of the more bankable stars out there. Compare Li's box office performance to such stars as Nicolas Cage, John Travolta and Arnold Schwarzenegger, and it's easy to see that Li is one of the most bankable action stars around. His last two films have averaged an opening of $15.5 million. The latest one, Kiss of the Dragon, had a very respectable per-screen average of $6,570. The One marks the first true blockbuster release for Li, and the hype has certainly reinforced that. Replacing traditional kung-fu-type action and a straight-forward action plot are dazzling special-effects reminiscent of The Matrix, and a story that is supposedly quite intricate and heavy on the sci-fi element. I am fully expecting The One to mark Li's evolution to the next level of box-office stardom, and finally mark him as the biggest action star around. His largest audience has mainly been young males, with a slightly heavier appeal to the urban demographic. With a confident and impressive screen count of 2,894 screens, I expect The One to go beyond Li's usual fan base and pull in an opening box-office total in the range of $26-30 million. The final, and arguably lowest-profile, debut this week is Domestic Disturbance, starring John Travolta and Vince Vaughn. It will be interesting to see if Travolta can follow up on the low-level success of this past summer's Swordfish. Domestic Disturbance, which seemingly suffers from an often-tread and abused formula, will compete for much of the same audience as The One. The bottom line with these two films is that The One looks like a fun time at the theaters and Domestic Disturbance doesn't. Travolta is no longer a bankable star, and viewer trust in him is quite low after the horrible 2000 campaign he had. The movie should still do reasonably well, but I do not think it will even match Swordfish's lackluster performance. I would expect Domestic Disturbance to finish third in the race, with a box-office take in the range of $13-16 million.